March Slide Shows by Maple Leaf Adventures - Maple Leaf Adventures Corp. Learn more about the nature of the BC and Alaska coast, and about trips on the Maple Leaf! Parking is available for $2.50 for 4 hours. Click here for a map. View the poster in PDF format. Join naturalists Hayley Shephard and Maureen Gordon for an evening of adventure travel, wildlife conservation and the story of following dreams. It is an odyssey seen through stunning images and captivating film of two of our Earth’s great natural havens: South Georgia Island and the Great Bear Rainforest. Travel information will also be available. Kayaking to Save the Albatross: Vancouver Island based wilderness guide Hayley Shephard set out to attempt the very first solo sea kayak expedition around the remote Sub-Antarctic Island of South Georgia to raise awareness for the Albatross. While Hayley paddled alone beside this gale torn island, wildlife and weather dictated her every move and battle with obstacles and challenges were endless. The presentation ‘A Beautiful Burden’ encompasses the human elements of courage, character and personal challenge while a dream is being fulfilled. Albatross will take the spotlight as Hayley links their unique behaviors and admirable feats to the devastating situation which may eliminate them from our planet. Entertaining story-telling, stunning images and captivating video stylishly merge the imperative tale of the Albatross and one woman’s dream to kayak alone around a treacherously spectacular island to help save a magnificent bird. Featured presenter at the Vancouver Mountain Film Festival 2011. Sailing the Great Bear Rainforest for Good: Working on the BC schooner Maple Leaf for seven years, in BC fjords and archipelagos that are hundreds of miles from the last road, Victoria guide Maureen Gordon has witnessed how adventure tourism helps to save bears, whales and seabirds. Just 10 years ago, most grizzly bears ran in fear from humans; now, in special places, totally wild female bears will nurse cubs in front of people. This is the result of conservation and ecotourism working together in BC. Through beautiful video and stunning photos captured on Maple Leaf expeditions, Maureen will share stories of coastal wildlife, natural history and the growth of trust between human and bear. Ecotourism can help change the world… and protect BC’s rugged fjords and archipelagos — some of the planet’s last wild places. Information about travelling on the Maple Leaf will also be available. Join Maureen for a visual odyssey through the natural history of the BC and Alaska coast. From the spring plankton bloom that culminates in spectacular concentrations of feeding humpback whales, to the autumn salmon that feed grizzly and spirit bears, you’ll learn about the natural engines that power life on the coast. Photos and video, from intertidal habitats to calving glaciers included. 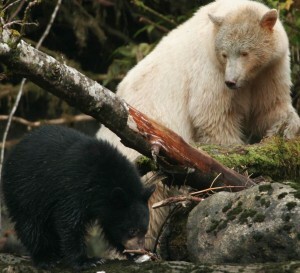 After Maureen’s presentation, researcher and conservation director Brian Falconer, of Raincoast Conservation Foundation, will talk about Raincoast’s bear conservation research in the Great Bear Rainforest as well as their effort to protect bears from commercial trophy hunting in the habitat of the spirit bear. Information about trips to Alaska, the Great Bear, Haida Gwaii and other coastal locations will be available. nd spirit bears, you’ll learn about the natural engines that power life on the coast. Photos and video, from intertidal habitats to calving glaciers included. Learn more about Maple Leaf Adventures vacations, directly from our experienced crew on this first-ever webinar! “Wild BC and Alaska by Sail” will explore the highlights of each area and the unique benefits of travelling aboard the Maple Leaf. It’s an online version of our popular slide show series – now accessible to anyone, anywhere. System Requirements: Flash player 6.0 or later or Windows Media Player 9.0 or later or QuickTime 6.0 or later. Check your system here.